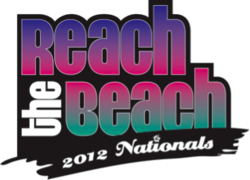 The EPIC Brands, home of American Cheer and Dance Academy and Spirit Unlimited, hosted their 13th annual Reach the Beach Rec and School Cheer and Dance National Championships in Ocean City, MD on February 24th-26th, 2012. First and foremost, the EPIC Brands would like to thank all those who participated in the largest Reach the Beach Rec, School, and Dance Nationals to date. This event, hosted at the Roland E. Powell Convention Center in Ocean City, MD on February 24-26th, 2012 was truly a great experience for all who were involved. Not only was there a brand new setup on the main stage, a second stage was constucted upstairs for the first time this year. Needless to say, Reach the Beach Nationals outgrew that second room in the first year! Next year, the event producers will have an extra 10,000 square feet of space to work with after the convention center renovations are complete, so the EPIC Brands hopes to utilize that extra space to make the event even bigger and better. Tina Colbert, coach of Archbishop Carroll High School who won a BRAND NEW Kia Soul! EPI would also like to give a special shout out to Surfy the Spirit Shark, the spirit mascot for Reach the Beach, for doing a remarkable job entertaining the crowd this weekend. Visit Surfy on the web at http://www.facebook.com/reachthebeach or at http://www.twitter.com/epicsurfy. The staff at the EPIC Brands are proud of all competitors and we look forward to seeing all teams next year for another fantastic Reach the Beach Nationals!